Cafe Julia, the new restaurant at the YWCA of Oahu on Richards Street, opened for business this week. The new eatery is managed and operated by the Shinyou Group, LLC, which is also going to handle catering operations as Laniakea Catering. Cafe Julia is located in one of the most beautiful historic buildings downtown and named after its architect, Julia Morgan. Morgan was one of only a handful of female architects in America during the 1920s when she ﬁrst began work on YWCA Laniakea Center. She is best known for designing the Hearst Castle, or San Simeon, in California. 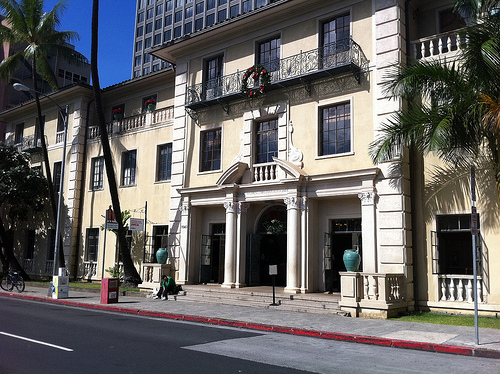 The YWCA Laniakea Center is listed as one of Morganʼs eight favorite buildings and is registered as an ofﬁcial historic building in the State of Hawaii. Cafe Julia @ YWCA will be open Monday through Friday for breakfast and lunch. Takeout service is available. While the building is rich in history, Cafe Julia @ YWCA promises to serve a modern, fresh, wholesome and dynamic menu in a fun and vibrant atmosphere. Laniakea Catering will cater to business functions and weddings. The Fuller Ballroom is downtownʼs newest and largest meeting space accommodating up to 150 people and is equipped with modern AV amenities. Events can also be held at the beautiful outdoor courtyard or any off-site location. The group is made up of four partners: President Bruce Watanabe, Emerson Ribao, Lance Kosaka and Derek Watanabe. Each partner has more than 20 years in the restaurant and catering business. Ribao is vice president and general manager. Ribao was previously general manager for Kobe Steakhouse for over 20 years. Lance Kosaka will serve as executive chef. Chef Lance began his career at Alan Wongʼs Restaurant in 1995 before moving to The Pineapple Room where he was executive chef for the past four years. Chef Derek Watanabe will lead Laniakea Catering. Shinyou hired Ken Weir as catering sous chef and Noelle Nahale as pastry chef. The YWCA of O’ahu is a membership organization supporting more than 2,500 women and girls through housing, career development, leadership training, economic advancement and health and wellness programs. Founded in 1900, it is the oldest and largest women’s association in Hawaii. The Shinyou Group will give a percentage of the proceeds from the restaurant and catering to support YWCA programs. For questions and general information please contact Bruce Watanabe at (808) 551-3458. For catering and events, please contact Ashley Pique at (808) 485-9464. This entry was posted in News, Restaurants. Bookmark the permalink.